Alien Hunter Video Slot Guide & Review - Casino Answers! Alien Hunter is a 5-reel, 25-line video slot developed by Playtech, featuring a wild substitute symbol, scatter wins, a free spins feature, two bonus games and a progressive jackpot. You can play the Alien Hunter video slot at Bovada. 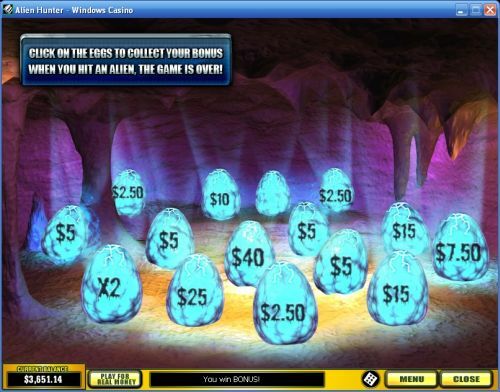 Bets on the Alien Hunter slot machine are $0.01, $0.05, $0.10, $0.25, $0.50, $1, $2 and $5 per line. You can select from 1-25 paylines on a spin in Alien Hunter at 1-10 coins per line. The lowest total bet you can bet on the Alien Hunter video slot is a penny – making it a penny slot. The highest total bet is an astounding $1250 per spin. 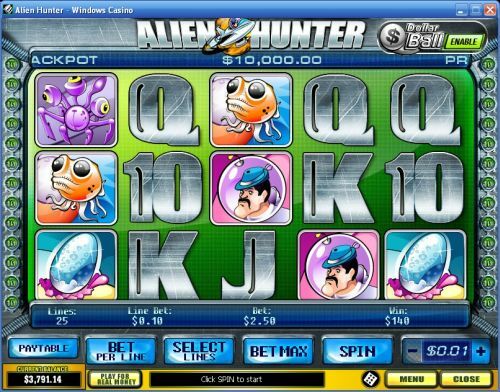 Alien Hunter has an a betting range that is extensive enough for any slots player. You can play any bet you can think of on the Alien Hunter video slot. To play all 25 lines at 10 coins per line, hit the “Bet Max” button or simply hit “Spin” for all other bets on Alien Hunter. Alien Hunter’s top paying symbol is the Caged Alien symbol. If you hit 5 of these symbols on a selected payline, you will win the 10,000 coin top jackpot. The Caged Alien symbol is wild and will substitute for all every symbol except for the scatter and bonus symbols. The second highest paying symbol in Alien Hunter is the Orange Alien, which can pay out as much as 1000 coins. The scatter symbol on the Alien Hunter online slot is the Spaceship symbol. 3, 4 or 5 Spaceship symbols anywhere on the reels will win you 5, 10 or 25 free spins. If 3 Alien Hunter symbols appear on the reels at any time on the Alien Hunter video slot, you will trigger the Alien Hunting bonus game. You will have the choice to either test your luck or or test your skill. If you choose luck, you will not have a timer to deal with and you will be able to shoot 6 aliens at will. Your bonus will be determined randomly, regardless of your shooting skills. If you choose to test your sharpshooting abilities, you will have 15 seconds to shoot up to 6 aliens. Green aliens are worth the least, blue aliens are worth more and red aliens are worth the most. You will can win more cash by playing the skill version of the bonus game, but you can also win a lot by playing the luck version. You can try the Alien Hunter skill-based bonus game at Bovada! Alien Hunter features a Dollar Ball progressive jackpot sidegame. You can find the Dollar Ball sidegame in the top-right corner of the screen. You will be able to make $1 bets to play for the Dollar Ball progressive jackpot. It is a lottery game where you are given 5 numbers and if you are able to match all 5 numbers, you will win the Dollar Ball progressive jackpot. If you match 4 numbers, you will win 1% of the progressive jackpot. Even if you match 3, 2 or 1 numbers, you will still take home smaller prizes. Only the highest win is paid per line. Winning combinations must be from left to right (except scatter symbols). Payline payouts are multiplied by the bet per line. Scatter wins are multiplied by the total bet. The wild symbol will substitute for all symbols except for the scatter and bonus symbols. You can find the Alien Hunter autoplay mode under “Menu.” You can play up to 9999 autoplay spins. Use the arrows to open up advanced settings in the Alien Hunter autoplay mode. You can set it to stop on jackpot win, on a single win more than (any amount you input), overall win more than (any amount you input), overall loss than (any amount you input) and you can also modify the delay between spins. You can stop the Alien Hunter autoplay mode at any time. Alien Hunter has good payouts, a decent progressive jackpot sidegame, a free spins feature and two very good bonus games. Alien Hunter also gets points for the choice between skill and luck for the Alien Hunting bonus game. If you’re looking for a good sci-fi slot game, Alien Hunter is definitely one of the best around. You can play Alien Hunter at Bovada. Can I play the Alien Hunter video slot for real money in the United States? Unfortunately, American players cannot play Alien Hunter at Playtech online casinos at this time. For an alternative, you can play the amazing Cosmic Quest iSlots that also have skill-based bonus games at the USA-friendly . For more information, feel free to read our Rockbet Casino Review. Do I need to download any casino software to play the Alien Hunter online slot game? Yes, you can play the Alien Hunter Flash game for free or for real money at Bovada. If you experience any difficulties with the Flash Instant Play casino software, make sure you have the latest version of Adobe Flash Player installed on your computer. How do I win the Dollar Ball progressive jackpot? You will win the Dollar Ball progressive jackpot if you are able to match your 5 numbers to the 5 numbers that the lottery game selects. You can only play the Dollar Ball progressive jackpot for real money. You can also find the Dollar Ball progressive jackpot on the following video slots: Golden Tour, Captain’s Treasure, Silver Bullet, Lotto Madness, Desert Treasure, A Night Out, Dr. Lovemore, Football Rules, Forest of Wonders, Greatest Odyssey, Wanted Dead or Alive, What’s Cooking and Thrill Seekers.